Merry Christmas, everyone! For this special day, I have a new retro review of a game series that screams "Christmas!" to me. Each Banjo-Kazooie release I have received was around Christmas time, so that's why when Christmas and gaming are mentioned, I think of Banjo-Kazooie. 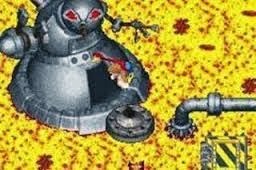 This retro review is for the under-appreciated Game Boy Advance entry in the series, Grunty's Revenge. It was a big blow for Nintendo gamers when the news that Rareware, makers of such fantastic titles as the Donkey Kong Country, Diddy Kong Racing, Jet Force Gemini, Killer Instinct, and Conker franchises were bought out by Microsoft of all companies. However, even after Microsoft's purchase of the company, Rare still was able to create games for Nintendo's handhelds, specifically the Game Boy Advance. This was due to Microsoft not having a dog in the portable fight. Regardless, THQ went on to publish all of Rare's GBA efforts. 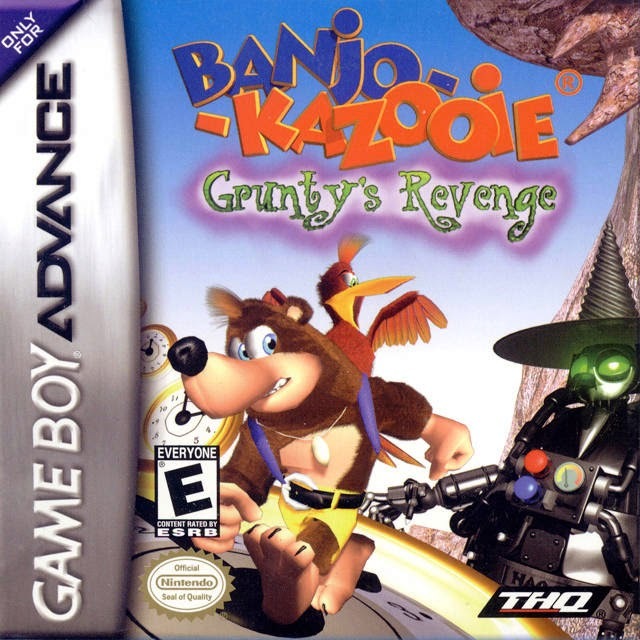 The first finished project that came out of the publishing deal was Banjo-Kazooie: Grunty's Revenge, a portable entry that played similarly to the series' entries on the Nintendo 64. What it amounts to is a fun diversion for a short while... a very short while. After the events of the original Banjo-Kazooie, Gruntilda the witch is stuck under a gigantic boulder near Banjo and Kazooie's home. Her faithful henchman Klungo comes up with a mechanized body that ol' Grunty can transfer her ghost into. The newly mobile Mecha-Grunty drops by Banjo's house and nabs Kazooie, taking her approximately two decades in the past, as a plan to make it so Banjo and Kazooie will never meet. Thus, that means the dynamic duo will never have the opportunity to defeat Grunty in the events of the original Banjo-Kazooie. However, local shaman Mumbo Jumbo uses his mystical powers to send Banjo back in time in order to put a stop to the green witch's mischievous plot. For Banjo especially, home is where the honeycomb is. Banjo-Kazooie: Grunty's Revenge's progression is just like the Nintendo 64 titles. 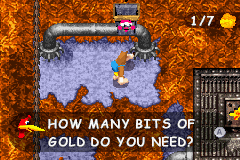 That is to say that through collecting Jiggies, golden puzzle pieces scattered throughout the game's various worlds, you unlock new areas to explore. The game contains five major worlds and one hub world, which connects everything together. This hub world is an old version of Spiral Mountain, one that was around during the construction of Gruntilda's evil lair. 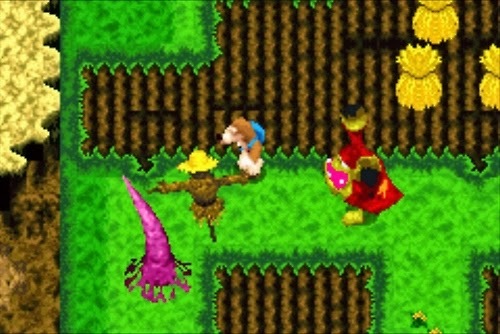 The main difference between Grunty's Revenge and the N64 releases that preceded it is that this Game Boy Advance entry is played in an overhead perspective. Obviously it's due to the technical limitations of the GBA hardware, but at the same time the general feel of the N64 Banjo-Kazooie games is retained. It's massively fun and engaging to explore the relatively large worlds, such as Cliff Farm and Breegull Beach, for Jiggies and musical notes. The latter allows the bear and bird to meet up with Bozzeye, a relative of Bottles the Mole, who teaches the pair new moves as long as they have acquired enough notes. Pretty much all of these moves come from the console games. 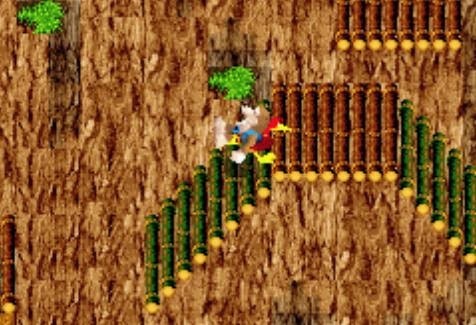 These include Banjo's roll attack, the Flap Flip that allows Banjo and Kazooie to reach high platforms, and the Talon Trot that enables the duo not only to move faster but to walk on otherwise steep and slippery slopes. That's just to name a few of the many moves able to be learned. ...Or use it to climb steep slopes. Like Banjo-Kazooie and Banjo-Tooie before it, Grunty's Revenge offers different platforming and puzzle-related challenges to acquire the ten Jiggies that rest in each of the game's worlds. Some have you participating in mini-games, such as sliding down a spiral slide, collecting eggs, or fishing for special salmon. Others require your platforming abilities to be strong, although it can be a little problematic telling what platforms you can and can't reach due to the overhead angle of the game. None of these missed jumps due to not being able to totally discern jump height and distance cost me any lives, but they can be troublesome all the same. "fetch me this many thingamajigs" mission. To assist Banjo and Kazooie in this time traveling adventure, Mumbo Jumbo, as long as he is paid with a silver Mumbo token, will change Banjo into a variety of transformations. From a mouse to a candle, these transformations allow Banjo into otherwise inaccessible areas. However, these also are usually only good for a Jiggy or two. It would have been nice to see each transformation's usefulness extend further from only one or two roles. Perhaps the biggest issue with Banjo-Kazooie: Grunty's Revenge is how quickly the whole adventure is over. I managed to play through the game to 100% completion in less than five hours my first go-around, and that amount of time understandably shrunk the second time through. Still, if the words "short and sweet" could be applied to anything, they would apply really well to Grunty's Revenge. What is also sweet in Banjo and Kazooie's handheld outing is how great the visuals look. Don't be fooled by the enlarged screens of this review, which stretch out the resolution beyond what you'd see on the Game Boy Advance. 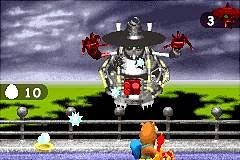 Grunty's Revenge is a great looker, and its prerendered visual style is a major part of that. 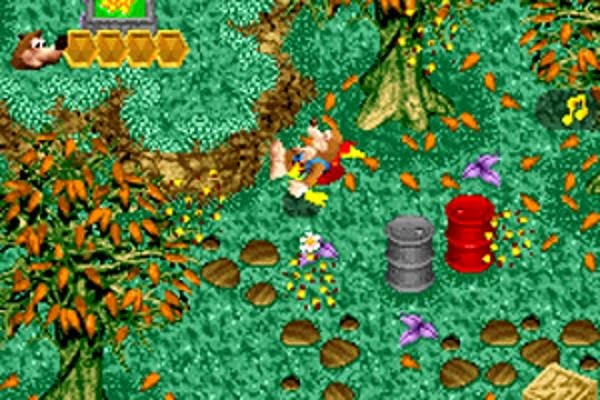 The music and sound effects feel like they were plucked directly from the N64 games, albeit with lower sound quality, and that is a tremendous accomplishment all in all. Banjo-Kazooie: Grunty's Revenge may not be the longest platformer out there, and it certainly has its fair share of flaws. However, if you can't get enough of the brave bear and sassy bird, then definitely look into their pocket-sized adventure.